New Delhi: In this fast paced world, where everyone is trying to reach the finishing line to see the gold medal around their necks, the students of Management Development Institute (MDI) Gurgoan took out time to learn the art of giving back to the society. The ‘Samaritans’, a student run social initiative club of MDI Gurgaonwas actively involved in providing impeccable service to the community. The Samaritans conducted a week-long event, which was inaugurated on August 03, 2018. They addressed several social issues and conducted various activities for the welfare of the society with a view to inculcate a culture of social responsibility among aspiring managers of tomorrow. During the event, the students who participated were highly elated to get an opportunity to touch and impact the life of others directly through their visit to different NGOs such as, the Earth Saviours Foundation for homeless people, Tau Devi Lal Foundation for destitute women, Deepashram, an NGO for mentally and physically challenged children, etc. 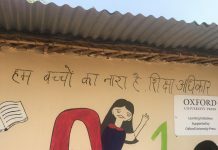 The students also engaged with other NGOs like ‘Mission Learning’; open classes for underprivileged children, ‘Alankaar’; the school for underprivileged kids, the ‘Dream Girl Foundation’; that educates about female hygiene. Further, a collection drive was initiated on campus where students and faculty members donated old clothes and books. These items were then given to NGOs during NGO Visits. Some programmes were organized to engage with school children. Also arranged were dental check-up camps, blood donation drive, tree plantation, etc. Through these initiatives the students realized their economic, social and environmental responsibilities and their duty to serve people and create value for all. The social initiatives taken by these students will help develop a sense of empathy and responsibility towards society among the managers of tomorrow.